TALLY WEiJL - Spring Collection 2011 | Memorable Days : Beauty Blog - Korean Beauty, European, American Product Reviews. Have you girls heard of the store TALLY WEiJL before? It's a clothing store from Switzerland and it operates in many countries, like Germany, France, Austria, China and more. They even have 9 stores in The Netherlands, I thought that they only had one here >.<" (Go to their website to see the exact locations of the stores) I always go to TALLY WEiJL when I'm in Utrecht (Centrum Hoog Catherijne) a place in Holland ^_^. I recently joined their Facebook page and saw their latest Spring collection of 2011. I just wanted to share it with you girls ^^. "Like" their Facebook page and you can join their giveaways and competitions or go to their website: www.TALLY-WEiJL.com to see their whole Spring Collection. These are a few items of the spring collection which I like =D. 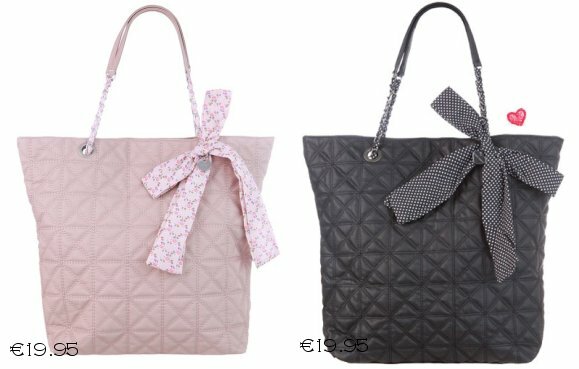 I'm really in LOVE with the grey bag, it looks so cute and it's affordable as well ^^ Do you see something that you like in this collection? Yesss, here i go again.. I have a bow obsession you know xD lol.. ! These shoes are looking classy but nice, don't you think =D? Source: pictures are from the TALLY-WEiJL.com facebook page & their website. Have you seen the Spring Clothing Collection 2011 already? : http://www.memorable-days.net/2011/03/tally-weijl-spring-clothing-collection.html. en die laatste kousjes ook! dankjewel voor het terugvolgen en de lieve reactie haha! Jaa, bij tally weijl hebben ze echt leuke dingen! Wist niet eens dat hij ook in Nl te vinden was, ging er elke keer naartoe wanneer ik in Oberhausen in Duitland was. Wuah! Everything's SO cute!! I especially like the boots. And the belt!! Never seen one so cute!!! @Man teng, jaaaa, ik vind die vintage bag ook moooooi xD !!!! en zekers niet duur =D ben benieuwd hoe hij in het echt eruit ziet ^^! hey hun :) thanks for dropping by my blog, i'm already following yours for a while ^_^!! and cool giveaway too! oh and i LOVEEEE the brown satchel (the one on the right) above!!! Do they ship to Australia xD ? hehe. @Suzy, ahwww, jammer =( hopelijk komt er eentje in je buurt later ^^! @Naomi, ik denk dat deze merk voornamelijk in Duitsland heel bekend is. In Nederland is ie waarschijnlijk iets minder bekend omdat de filialen niet in grote steden zitten denk ik =(. I love the satchel - the right one!! Lovely picks! Wow, these are lovely =D !